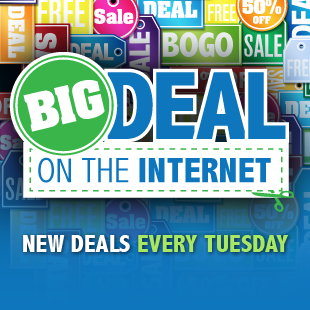 This week's Big Deal leads with some Triple-A deals. Tom Clancy's The Division has landed on the PC, PlayStation 4, and Xbox One. Gamers sitting on the sideline that have been swayed due to the numerous Let's Play and live streams on Twitch/Youtube actually have some small respite in savings, particularly if you're a PC gamer. For those planning to play on Uplay, you can knock some decent discounts off on The Division's Gold Edition and Standard Edition, depending on your retailer of choice. For the Gold Edition (which is bundling in The Division's Season Pass), the cheapest place to grab the Uplay key is at GMG, where if you use our coupon code DEALZON20 - you can knock an easy peasy $20 off list price, making the Gold Edition only $80. For the Standard Edition, while the code also works at GMG for $48, the best price is still at Games Planet due to currency conversion favorability. Since Games Planet is selling Uplay copies that can be activated world-wide, buying the game there results in paying only about $42.62 in USD (converted from £29.99). Note that the final amount depends on your bank's currency conversion. Another big release this week with a spectacular deal on PC is the 2016 Hitman. Here you'll find a 25% discount on PC at GMG, dropping the "Full Experience" (full game) from $60 to only $45. The same code also works on the first episode "Intro Pack" dropping it from $15 to only $11.25. Tom Clancy's The Division Gold Edition (Uplay) - $80.00. Use Code: DEALZON20 at checkout. Released today. List is $100. For the Xbox One and PS4 version, Best Buy is giving you $10 in My Best Buy Rewards and if you're a paid Gamers Club Unlocked Member 20% off. Tom Clancy's The Division (Uplay) - $42.70. Released today. List is $60. Price converted from £29.99. You can also grab from GMG at $48 after coupon code: DEALZON20 at checkout. Hitman - The Full Experience (Steam) - $45.00. Use Code: DEALZON25 at checkout. Releases March 11. List is $60. Deal expires March 14. The Intro Pack is only $11.25 after the same coupon, which is the first episode of the game. Xbox One 1TB Holiday Bundle + The Division + Rainbow Six Siege + AC: Syndicate - $399.99. List is $580. Deal expires March 16. Buying those three games separately at their best prices online would cost $145 extra. PS4 Uncharted: The Nathan Drake Collection Bundle - $299.99. Nintendo 3DS XL: New Super Mario Bros 2 Limited Ed. (Refurb) - $115.00. Far Cry: Primal (Uplay) - $38.99. Released March 1. List is $60. Digital Apex Edition only $47.99 at GamesPlanet. Deponia Doomsday (Steam) - $21.60. Released March 1. List is $30. Deal expires March 11. Plants vs. Zombies Garden Warfare 2 (Origin, Xbox One, PS4) - $39.99. Released February 23. List is $60. Deal expires today. Alekhine's Gun (Steam) - $27.20. Releases March 11. List is $40. Deal expires March 14. Need for Speed (Origin) - $45.00. Releases March 17. List is $60. Deal expires March 14. Homefront: The Revolution (Steam) - $45.52. Releases May 17. List is $60. Starcraft II: Legacy of the Void Collector's Edition (PC) - $59.97. Fallout 4: Season Pass (Steam) - $29.99. Sid Meier's Civilization: Beyond Earth - Rising Tide (Steam) - $18.00. List is $30. Deal expires March 11. Tropico 5 (Steam) - $4.99. Super Mario Maker (Wii U) - $47.00. Fallout 4 (Xbox One, PS4) - $34.99. List is $60. Deal expires March 14. Assassin's Creed Chronicles Trilogy Pack (Xbox One, PS4) - $19.99. List is $30. Deal expires March 12. Dishonored: Definitive Edition (Xbox One, PS4) - $14.99. List is $40. Deal expires March 14.